The 38th seal of the Roboplastic Apocalypse lies torn and mutilated in the gutter like historical Hasbro documents of incalculable value entrusted to some guy who used them as handlebar warmers on his bicycle! Thrill to a horrific tale of the roboplasti-archaeological universe betrayed when I won an auction for the Dead Sea Scrolls of Hasbro price list history and then I lost them biking on my way to a Star Wars convention. What untold secrets of the universe lie buried in the Hasbro Toy Worksheet from 1984? How much did a case of Jetfires cost at wholesale in 1985? Can Mirage survive the torturous treatment at the hands of Wal-Mart demo boy? Find out all this and more in this GEOFFREY GIRAFFE WAS A SCUMMY G1 SCALPER AND I CAN PROVE IT edition of the Podcastalypse! 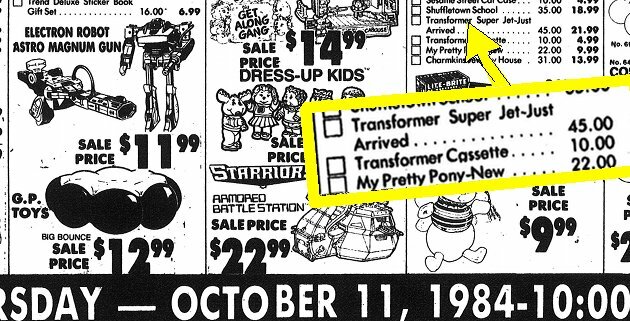 It's the age old question-How much did Optimus Prime cost in 1984? And of course the correct answer is it depended on how much your mom was desperate enough to pay to get you to shut up that day. It is in essence the truth because all the different stores had different prices. That's not to say certain estimates cannot be made and I've tried doing that in various sections of The Vintage Space Toaster Palace. But of course the estimates are never really good enough. Looking at the big picture, the only information retail prices from specific stores can give is an approximation of what the retailers paid at wholesale plus whatever each chain's overhead was and how much profit they were trying to make. 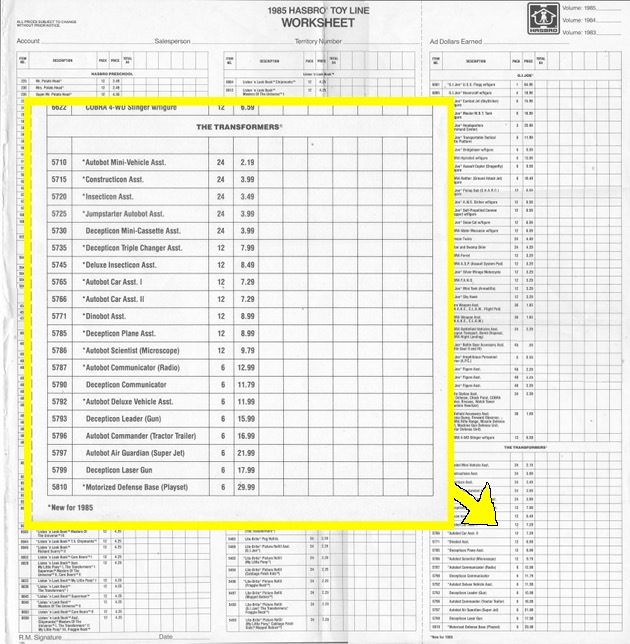 So I was really happy the day I found seller Bwills auctioning off the 1984 and 1985 Hasbro Toy Worksheet price lists. Finally I knew the wholesale cost of Optimus Prime, which is tremendously empowering information. So the next time I hear somebody ask how much Optimus Prime cost in 1984, I can tell them the wholesale cost and turn a fanciful question fueled by nostalgia into a dreadful exercise in post 1980s recession era economics. I am assuming the prices are per unit and not per case, but I admit that I don't know for sure. 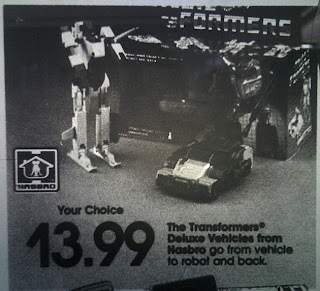 I am not an expert in 1984 wholesale toy buying nor connected in any way with Hasbro. (Well I guess I'm connected in the We-Are-All-Peter-Cullen's-Unwanted-Children kind of way, but so is everybody.) 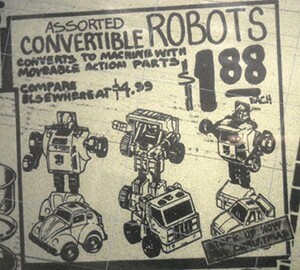 I guess it is theoretically possible that I'm misinterpreting this and a case of 24 Autobot Minicars only cost $1.99 at the wholesale level in 1984 but I highly, seriously doubt it. I do wonder, though, that if those minicars were $1.99 a piece at the wholesale level then how could stores like Fiesta Grocery Mart (below left) sell them for exactly or slightly less than that? For the most part, minicars sold very close to their wholesale cost at many stores. I guess they were the gateway drug of Transformers in that regard. Stores didn't make much of a percentage off of them. Then on the upper right you have the exact opposite of the minicar situation in this snippet from an R&E ad from October '84. 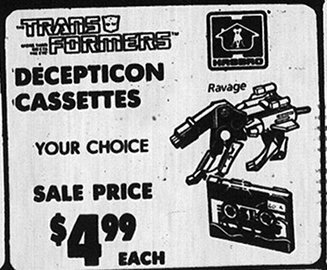 The Decepticon tapes going for a full dollar over wholesale must have made a lot of money. One memory I have from around 1987 is going to a Toys R Us and seeing an entire endcap stocked full with pegs of nothing but carded Transformers, the majority of which were the Decepticon cassettes of that year. 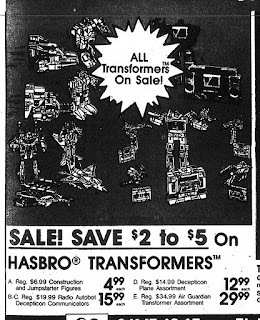 Although the cassette assortments hung around as long as the minicars did and stores loaded the pegs with them, I rarely ever see Decepticon tapes advertised in newspaper circulars. At least I don't see them as much as the Autobot minicars. It's not everyday that I see an ad from 27 years ago on YouTube and I can pretty much nail its air date within a few days. 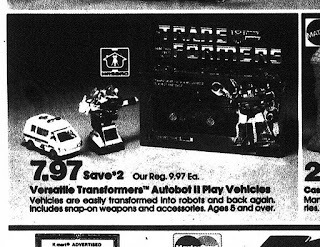 But thanks to my familiarity with old newspaper ads I was able to figure out that this commercial recently uploaded to YouTube coincided with a Wal-Mart sale on Autobot cars during Black Friday weekend of 1984. The ad to the upper left is one they ran November 27, 1984. 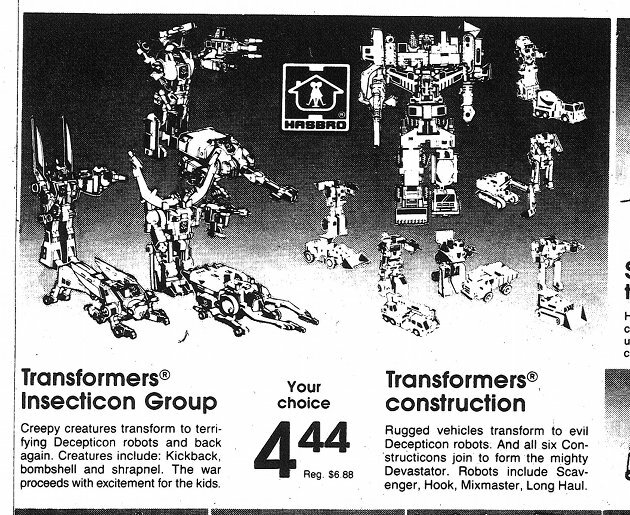 Notice how the ad and commercial point out 11 styles were available yet the '84 worksheet shows the case pack was 12. This is because Mirage was included twice in the first 5750 cases. 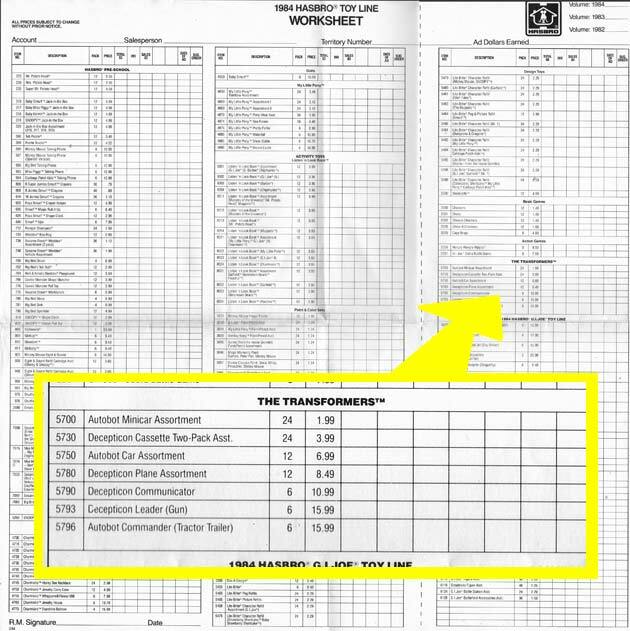 I found it amusing that the Wal-Mart narrator described the act of transforming as making "a few minor adjustments". I guess he was right because the resultant mangled mistransformations sure weren't successful robot modes. Actually Ratchet kind of looks better that way. The '85 worksheet. Note the lack of a Devastator giftset listing. Also Shockwave and Jetfire are not "New for 1985" as they had been shipping since late '84. 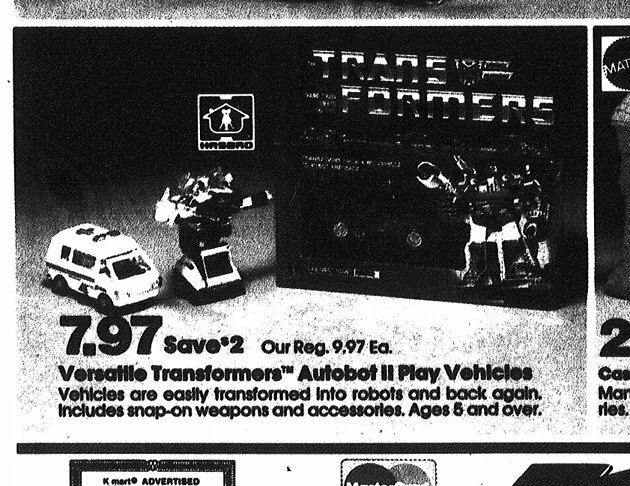 Above left is that strange K-Mart ad I mentioned with "Autobot II" vehicles. Since it ran September '84 I think it's referencing a case revision that eliminated one Mirage and added in Skids. The timing of the release of the 5750 Autobot Cars assortment that included Skids has proven difficult for me to pinpoint. This ad is the best lead I have but it's still a matter of interpretation. Had the Wal-Mart commercial included Skids among its 11 Autobot cars I would've been elated. 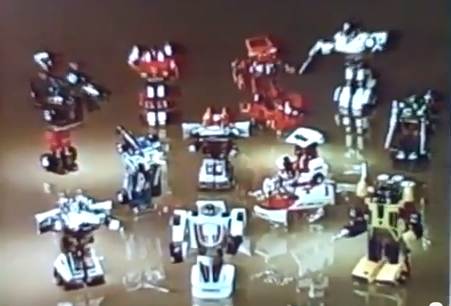 It would be the earliest documented appearance of Skids in a Transformers case assortment that I've seen yet. 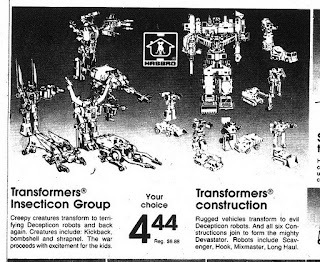 To the upper right is a Sears ad showing the Constructicons but giving no price for a Devastator giftset. Although a number of stores carried the Devastator giftset I have yet to find an order form or Hasbro price list including it. In fact, no giftsets appear on the 1988 Hasbro price list, either, and that year saw the release of the Seacon combiner Piranacon. 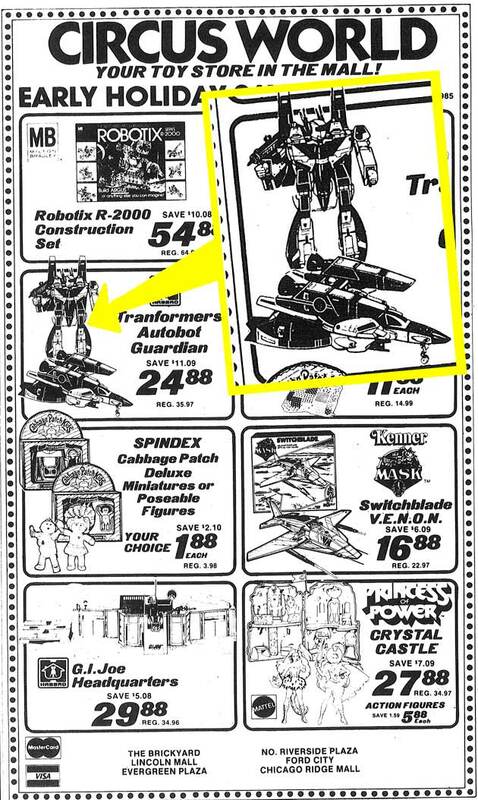 The Sears ad to the upper left is the only other occurrence I've found of Decepticon cassette line art being used. It's kind of cheating because the cassettes aren't even being advertised-it's more an ad for Soundwave. Now I admit I haven't seen every ad published but it seems to me the cassettes are well in the minority and use of their line art is ever rarer. 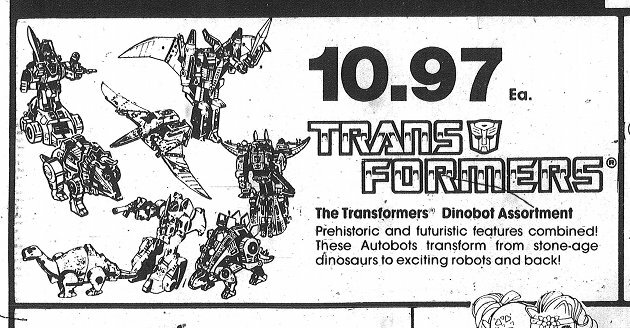 Speaking of cassette-ish things, it's kind of strange to me that Blaster line art isn't used in this ad when all the other toys shown are illustrated as drawings. 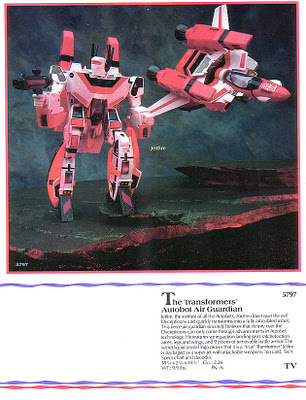 That picture was acually lifted from the 1985 Hasbro Toy Fair catalog. 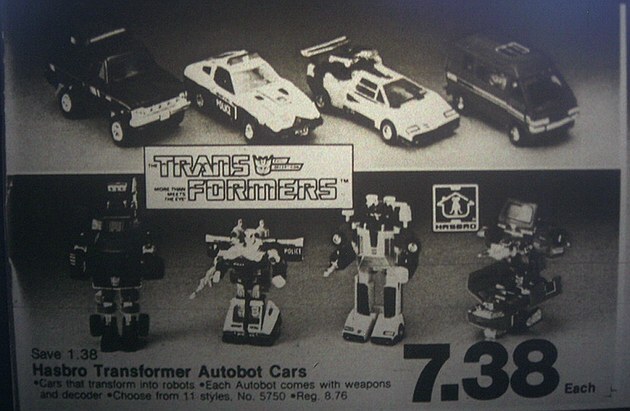 Even rarer than Decepticon cassette line art are ads for the Deluxe Autobots from 1985 like the one to the upper right. These non-Takara toys were rarely seen in papers, unlike Jetfire, Shockwave and Omega Supreme who were all non-Takara but at higher price points. It seems like only the least and most expensive assortments would appear in the papers most often, leaving the mid-price point range figures virtually unrepresented in newspaper ads. Figures like Blaster, the Deluxe Autobots and Deluxe Insecticons all suffer from this under representation. I have two Dinobot price memories. The first is seeing the JC Penny price tag attached to the side flap of one of my Dinobots. It was $19.99. So I grew up thinking the Dinobots were at the $19.99 price point. Boy was I surprised all these years later to find out they were more commonly in the $10-$15 range everywhere else. My other Dinobot price memory from childhood is seeing them on clearance at Lionel Playworld along with the Predacons for $6.97 each. It seemed like a super discount to me at the time but now that I know their wholesale cost was $8.99, that Playworld price doesn't seem so low. Still, as a retailer it probably hurt to be selling toys at $2 less than what the chain paid for them. It's crazy to think Dinobots at Playworld on clearance were three times less expensive that they were at JC Penny at full price. Who cares what I paid, how much did Geoffrey Giraffe pay? The 37th seal of the Roboplastic Apocalypse quacks up like a booby duck as I try to do a quick rundown of every Valkyrie toy robot released stateside during the great toy robots wars of the 1980s, but mostly I end up crying like a Minmay about how Jetfire was the worst thing that ever happened to every kid in North America. Thrill in confusion at my attempts to sort out how Shoji Kawamori's toy robot jet idea got spread across multiple different toylines in the U.S., yet we still managed to miss out on a complete line of the best versions of them all-the 1/55 Takatoku Valkyries. What was the connection between Matsushiro, Takatoku, Bandai and Hasbro? Would the Robotech toyline have been a success if Matchbox got the 1/55 Macross Valkyrie instead of Hasbro's Transformers? What do Jetfire, Rudolph the red nosed reindeer and Bozo the clown have in common? I don't know but I complain about it all anyway in this I THINK I'M TURNING VALKYRETARDED edition of the podcastalypse! I TOTALLY HAD A SUPER ZARDAK! OR WAS IT A JETFIRE-1S? OR AN AXOID VALKYRIE? 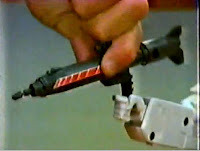 What trips me out about the American toy robots wars of the 1980s was how it looked like the battle lines were clearly drawn with the GoBots versus Voltron versus Robotech versus the Transformers versus everybody else, but in reality the companies behind the robots were getting along pretty good. 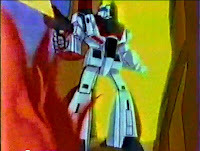 Bandai was supplying Matchbox with GoLions and Dairuggers for their Voltron line, Tonka with Machine Robo figures for GoBots and Hasbro with all sorts of Takatoku toys to make into Transformers like the deluxe Autobots, deluxe Insecticons and of course, Jetfire. Smaller versions of Takatoku toys ended up as part of Select's Convertors line, meaning although their larger counterparts became Transformers or Robotech mecha, the tinier versions of the exact same toys ended up with different names, colors and fictional backstories. 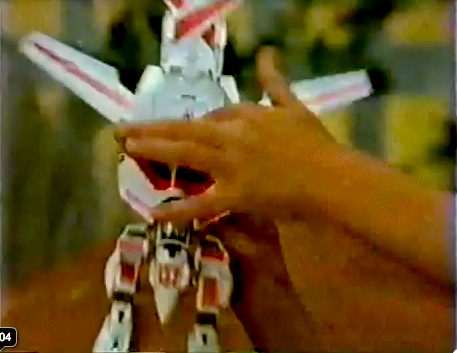 It was during this crazy, mixed up era of multi-company, international toy robot cross-licensing and distribution that the Macross Valkyrie was born. So it's not surprising that essentially the same core design got released in multiple versions across many different toylines in the U.S.. What is pretty wild is how famous this design became in each of its different incarnations. Everybody knows who Jetfire is and the Robotech Veritechs are pretty unforgettable in their own right. I'm not sure how many Zardak, Meeshak and Moriah fans are out there, though. 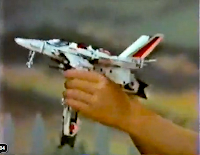 The Valkyrie invasion of the U.S. began in 1984 with Revell's Robotech model kits. 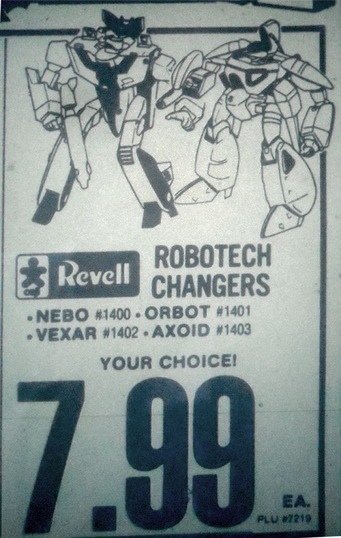 Revell's Axoid, Vexar, and Orbot (scroll down this page to see them in color) were actually repackaged models by Japanese kit manufacturer Imai. Revell also released 1/100 versions, which were sourced from a different Japanese kit maker called Arii. The 1/72s are interesting because of how initially they were branded as robots with names instead of just piloted mecha with Macross VF designations. Ads for the 1/72s pop up a lot in old newspapers but I've yet to find one for the 1/100 scale versions. The prices originally were in the range of $8-$12 in 1984 money depending on the retailer, which comes out to $17 to $25 in 2010 money. 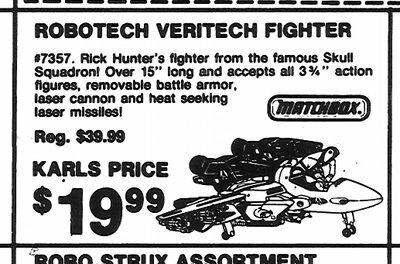 This wasn't too bad if you were looking for a realistically proportioned, transforming Robotech Veritech fighter. The Axoid, Vexar, and Orbot could be built and painted into very show accurate versions of their respective VF models but the packaging didn't reflect this. Instead they went with the weird alternate robotty names and non-Valkyrealistic paint schemes. I was ten years old when these came out and to make the connection between these models and the Robotech Veritechs without actually opening up the boxes required more paying attention than I was capable of. Pretty much if you said your robot was named Vexar, I took your word for it and kept on looking for a 'real' VF-1S model kit even though Vexar wasn't too different looking on its box illustration. I want to mention how much I love and miss Draddog's Robotech Defenders Model Kits page, which is now only available through archive.org. Draddog's page covered the Revell Robotech model kits thoroughly and it had catalog and packaging photos of valkyries I did not mention here, like the non-transformable gerwalk and battroid kits and also the armored valkyrie Revell released. There sure were a lot of valkyrie models back in the day. 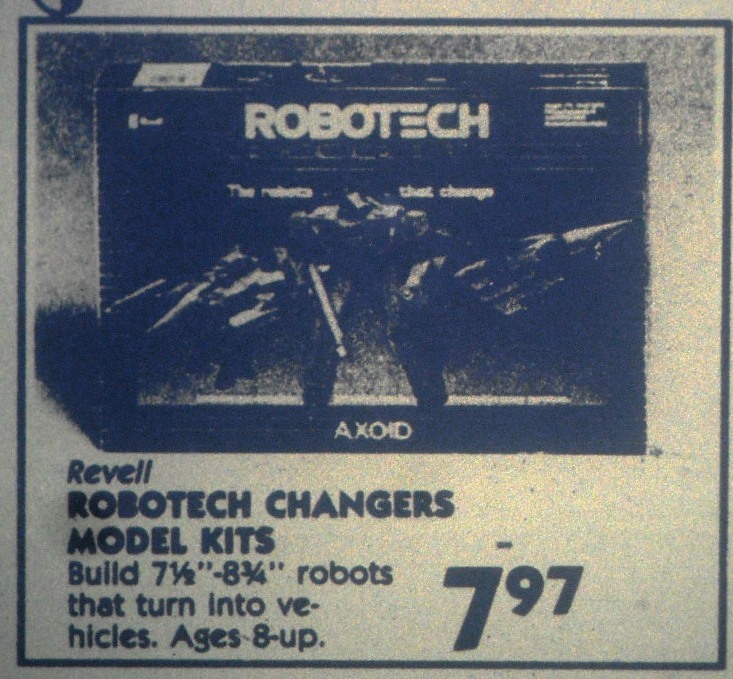 By 1986 the Revell 1/72 kits were hitting clearance. 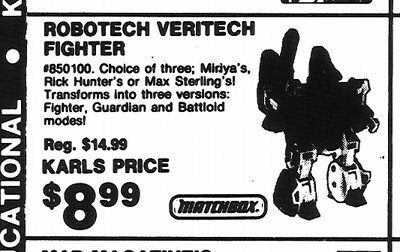 I've seen one '86 ad from Circus World where they're being sold for $1.99, which seems like a sad fate for the only realistically proportioned, transformable, Robotech brand valkyries. Zark and my mystery brown VF-1A from an unknown line. Select's Convertors line covered the gamut of small Takatoku toys and had a couple of Valkyries. 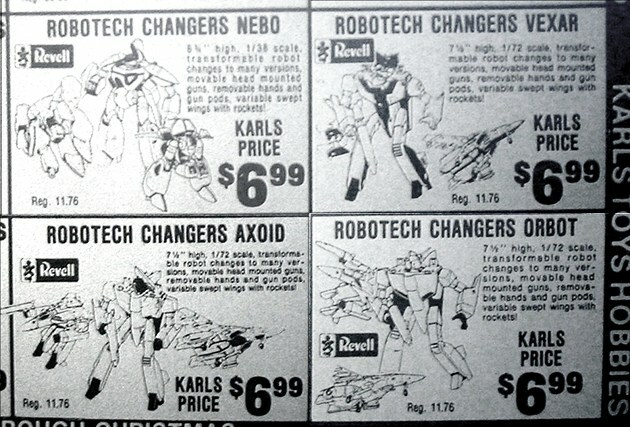 Just like Revell's Robotech model kit line they took a lot of liberties with the names of the toys and did some very non-Macross modifications like stickers and color schemes.At least one 1/100 scale VF-1S did get released in a deco unchanged from Macross but they named that guy Zark. They also did a Super Valkyrie with the fast packs and armor, colored it almost completely black and named that one Zardak. Zardak and Zark were brother Maladroids in the Convertors mythology and both were bad guy robots with nasty personalities. Zark came in other colors beyond the yellow/black Roy Fokker deco, including an all red VF-1S (check out this guy's red Zark review on YouTube). A brown cannon fodder VF-1A also exists in the Convertors scale and I've got one but I don't know what line it's from because I'm not the original owner. I suppose it is remotely possible it could be some undiscovered Convertor but if that were true I think someone would have documented it already. I don't know everything Select did so who knows if maybe they might have released the non-VF1S versions of these 1/100 valkyries alongside Zark or maybe even as Zark. One weird thing about Convertors Zark is they didn't change his name when they changed his color schemes. So the Zark package came standard on a couple different versions of the same toy. I don't know how many other versions of 1/100 VF-1As or 1Js floating around out there. There is one online toy store selling a loose 1/100 VF-1S very similar to the Convertors versions, but with green legs and forearms. They also have a VF-1A (also in the 1S color scheme except with green limbs) that they think was the victim of a head swap, but actually these are "Macres" knockoffs. Toyarchive.com has a nice Robotech section with individual pages covering the green limb VF-1S, VF-1J, and VF-1A Macres toys. Maybe my brown VF-1A is some sort of short lived knockoff that came out in the 80s and quickly disappeared from the shelves. From left to right in the picture above there's a 2002 reissue Bandai VF-1A I wanted to include here to illustrate what I call the "reverse Jetfire" color scheme I talk about in the show. Only two 1/55s ever in the history of Valkyries sported this black/red stripe combo and the other was the VF-1S Strike Hikaru released in 1984. Bandai's never reissued that one, though, and I really wish they would. The black/red stripe VF-1S is one of the most iconic Valkyrie color schemes since it's the one Hikaru used in Do You Remember Love to save the day. 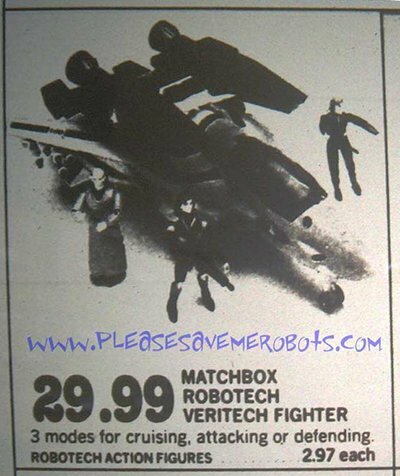 Then getting back to American Valkyries, there's the ginormous 3 3/4 inch figure scale Playmates reissue of the Matchbox non transforming VF-1S with a VF-1J face originally released as part of the Robotech line in '85. It's as close as Robotech ever got to a 1/55 and it makes me sad that it doesn't transform but with that big bulbous canopy it would look like Jetfire's pregnant cousin in robot mode. Then there's my yellowing old Bandai Jetfire and a Convertors Zark. The only things missing are the superdeformed Valkyries from Convertors and Robotech. I was never really into SD stuff. 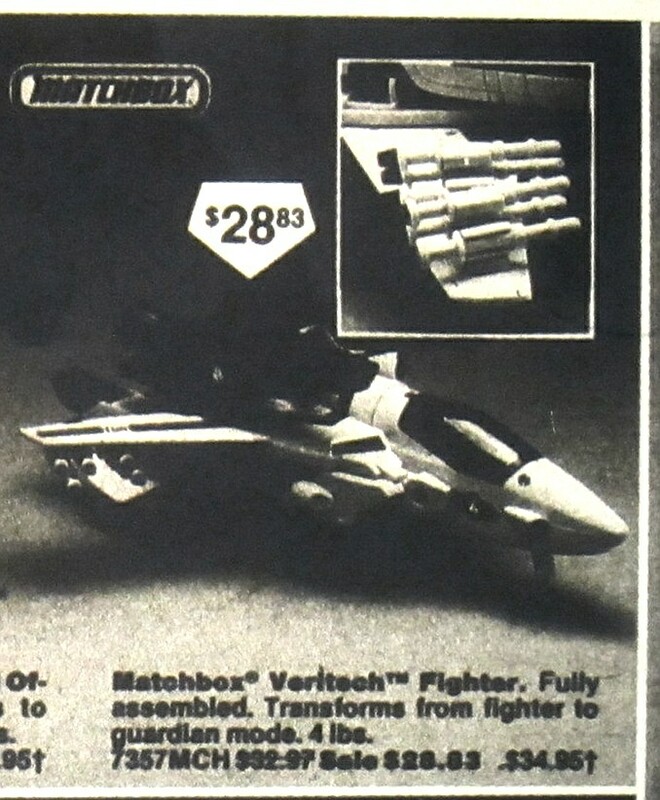 The Convertors SDs had friction motors and the Robotech ones looked goofy but they were the only transforming Valkyrie that line had outside of the model kits. It bums me out to this day that we got every goofy color scheme and crazy mold variation of Valkyrie under the sun, except the 1/55s in Macross colors. 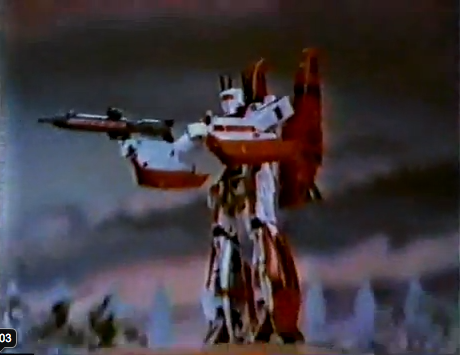 For most of my adult childhood I didn't have access to the Jetfire commercial like I do today thanks to YouTube. I am very grateful for YouTube because for a long time I didn't have access to this very important part of the American Valkyrie experience. So to celebrate how much I appreciate YouTube Jetfire commercial I've taken a couple screen shots of it and made a few observations about it. I'd recommend watching it yourself a couple times before going further because there's going to be a question at the end. There's something rather peculiar about the closing moments of the commercial that I never caught until just a few days ago. Can you find it before I explain it? Okay let's go! What's absolutely insane about the commercial is how fast it moves. Most of the scenes last maybe 1 to 2 seconds at the most before they cut to the next action. 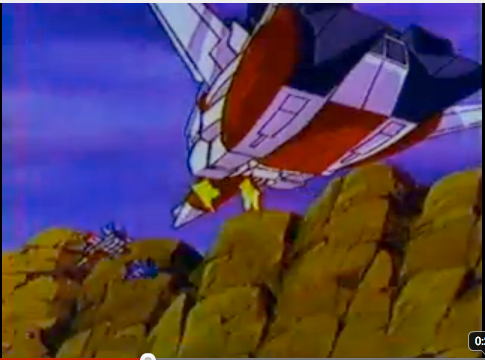 At the outset there's a sequence with Jetfire emerging from a mountain, firing off a few shots at Starscream, transforming, and then flying off into the sky. The whole scene takes maybe 2 seconds. I slowed it down and found some really nice frames in there that go by so fast you're hardly conscious of them. 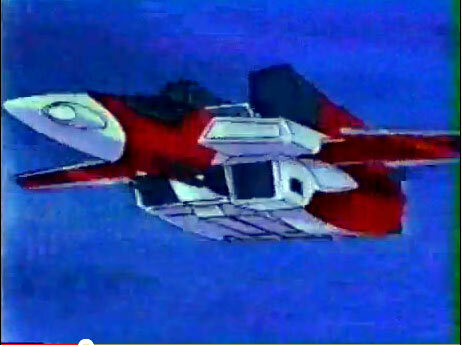 One interesting thing to note is it appears there's an Autobot insignia on Jetfire's chest. This was a pretty standard location for an Autobot sticker so it makes sense that at one point they intended it to go there on the toy, but production Jetfires don't have that. Instead it's on his jet nose. There's Autobot insignia on his chest in his regular cartoon model and comic book appearances, though. 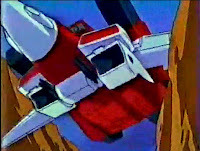 So then Jetfire immediately transforms after spending only milliseconds in his toy accurate cartoon model robot mode and he flies off into the rest of the commercial in jet mode. 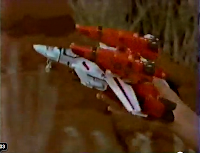 I don't know what this jet color scheme is based on but it's different from both the production toy and the prototype. It's got the white nose but the forward quarter of the rocket boosters are black and the canopy is blacked out. I don't know what this deco is based off of but it's most likely animation errors, especially considering it wouldn't be physically possible for the rocket boosters to change color like that. So Jetfire's ridiculously huge compared to Starscream and Thundercracker. 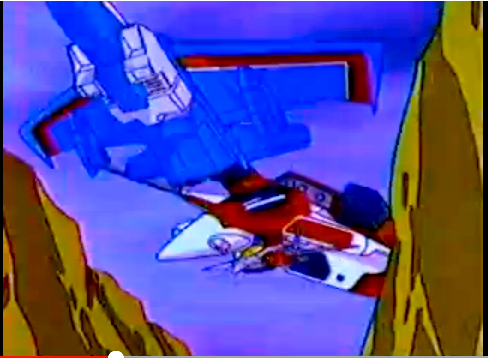 They must know this so they duck into a canyon that Jetfire doesn't fit in, but that doesn't stop him from magically shrinking down and pursuing them anyway. It's his commercial so I guess he gets to do what he wants. After some more miscolored frames we switch to live action with a kid flying the prototype around in jet mode and things start getting interesting. I believe that a deliberate attempt was made on the part of the commercial producers to avoid filming the Macross symbol on the left wing. I don't know why they didn't just paint over it but they sure do go to extremes not to show it. Here in the opening shot the toy looks like there's a solid stripe on the wing but I think that's because this is actually the other side of the toy and the film has been flipped so it looks like it's flying from the right to left side of the screen when in reality it was filmed going from left to right. The first thing that got me suspicious about the wing is how when the kid banks to the left he never really does a complete 90 degree tilt. Instead they tilt it just enough that you barely see the other wing before the whole jet goes out of frame. If I'm right and the image is mirrored, they did this to ensure the Macross insignia wouldn't be seen on the other wing. Then a quick montage begins of the kid transforming the toy. The jetpacks are slapped on the back and for the briefest of milliseconds you can see the Macross insignia on the wing. It goes by so fast that it's impossible to catch with the naked eye. 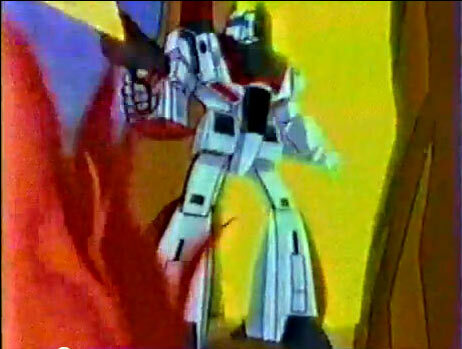 Then the rifle with the missile in it gets put into what is obviously Jetfire's right hand. But wait! Did you notice something in the previous frame? The rifle is already in on the toy, and it's in his left hand! So then here's the crazy weird thing about this commercial in its final moments. We already have evidence that the images are mirrored, but now as you watch the last sequence of the kid transforming it you can tell the footage is being played in reverse! 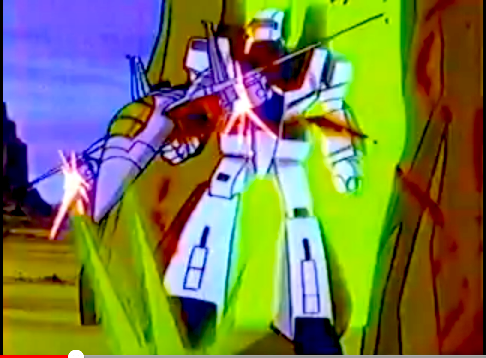 The kid started by putting the booster packs on, then the next scene is the rifle going into the already transformed jet's hand, then the next scene is the figure in half robot/half jet mode, and finally the kid is beginning to transform the jet. The entire final transformation sequence is all reversed! The transform is actually from robot to jet, but each individual scene is played forwards as the kid is going from jet to robot. Why they did this I don't know but I never noticed it until I watched the commercial for the 500th time. I so love the look of the prototype Jetfire that I digibashed this version of it. Now this is not what the true prototype would look like since the original would have different, notched head lasers and the sticker placement would be different in a few spots. The original would be a Takatoku version with painted red details instead of the modified Bandai job I've got here. But for the most part this is what the commercial prototype would look like if it were around today. I don't have deep enough connections in the toy collecting community to know where the original is or if it even exists anymore. 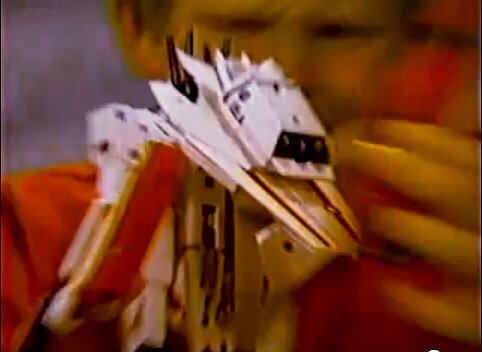 I believe it's possible that more than one may have been made since the one in the commercial has stickers and the one shown in a newspaper ad from Venture that ran in December '84 (further down in this post) doesn't. Of course it's possible the newspaper ad one is the original prototype before they stickered it, but I really don't know enough about the whole situation to speculate authoritatively either way. Jetfire, the swiftest of all the Autobots, zooms down over the evil Decepticons and quickly transforms into a fully articulated robot. This fierce air guardian sincerely believes that victory over the Decepticons can only come through advancements in Autobot technology. He features spring-action landing gear, ratchet-action arms, legs, and wings, and 9 pieces of removable battle armor. 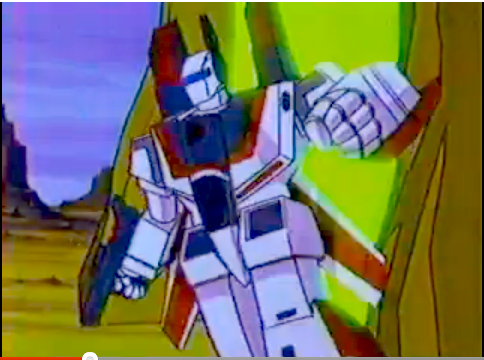 The secret liquid crystal logo proves that it is a "true" Transformer! 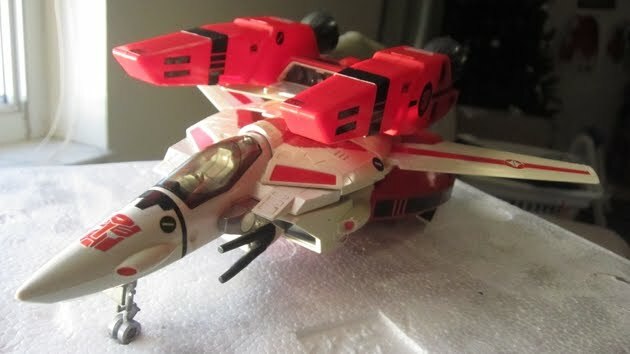 Jetfire is packaged as a super jet with attachable weapons, bio card, Tech Specs chart and decoder. Jetfire's appearance in the 1985 Hasbro Toy Fair catalog is notable in that he is not labeled "New for '85" like other releases in the same catalog. This is of course because Jetfire was an '84 release and retailers were already used to it being part of the line, so it would've been incorrect to introduce Jetfire (and Shockwave) as new that year. The figure shown isn't the early white nosed prototype nor does it carry a missile in its rifle. Hasbro really had their Transformers act together that year as is evidenced by the elaborate backgrounds and tech spec inspired personality profiles incorporated into the case assortment descriptions, two things that were lacking in their 1984 Toy Fair book. 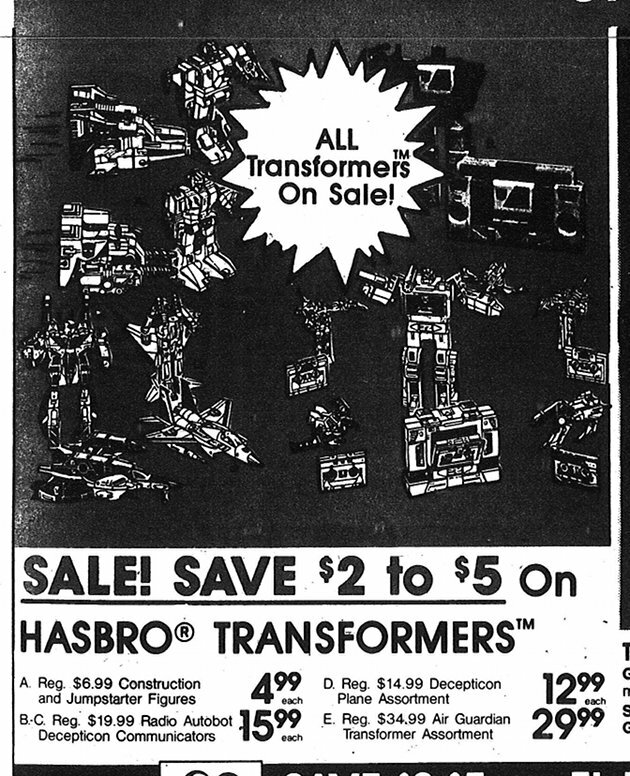 I love love love this R ad E ad from early October 84 because it's the earliest mention of Jetfire I've ever found in a newspaper ad. What's even better is that they announce it had just arrived, cementing my theory that Jetfire was purposely timed for release around the holiday season of 1984. Cut Rate Toys was one of the last great independent toy stores in Chicago. 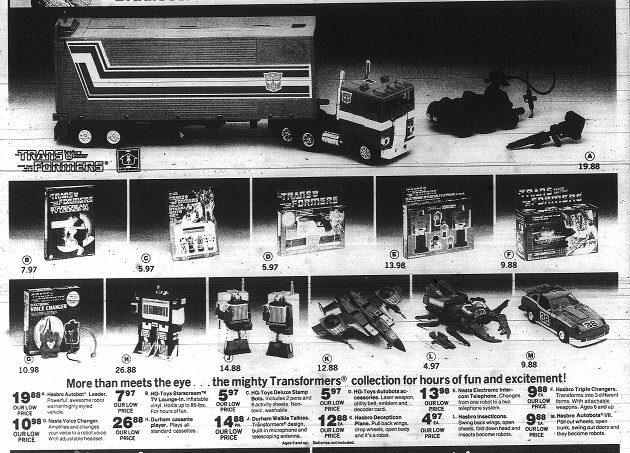 During the 70s and 80s it would run gigantic full page ads full of toys and toy descriptions. 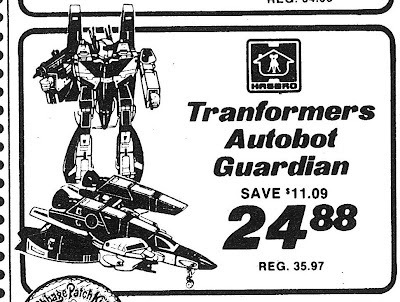 The ad above is from their black Friday 1984 ad and mistakenly uses Starscream line art in place of Jetfire. 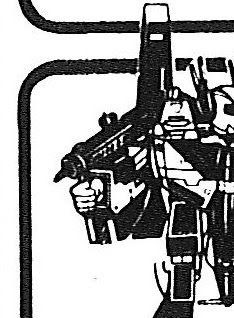 This furthers my suspicion that Jetfire line art either did not exist or was not widely distributed in late '84. 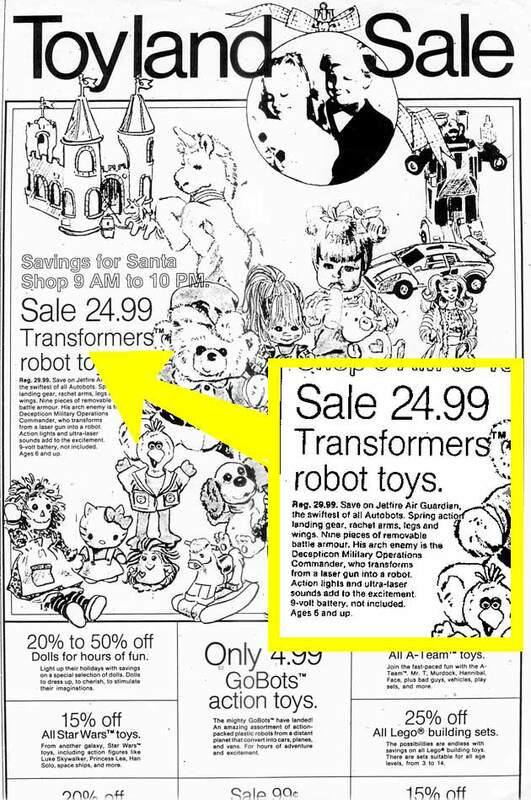 It was commonplace for retailers to describe Jetfire but not run line art until 1985. 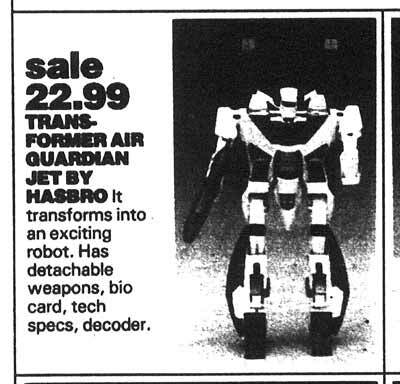 Early ads for the figure like this JC Penney one from 14 December 1984 typically included text describing Jetfire but not showing it. These are my two favorite Jetfire newspaper ads. The one on the left is from Venture, a retail chain that I've noticed would sometimes use prototypes in its toy ads. 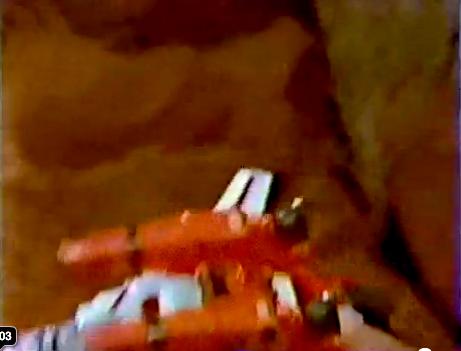 Here they've got a prototype Jetfire with the unpainted white nose and no stickers. 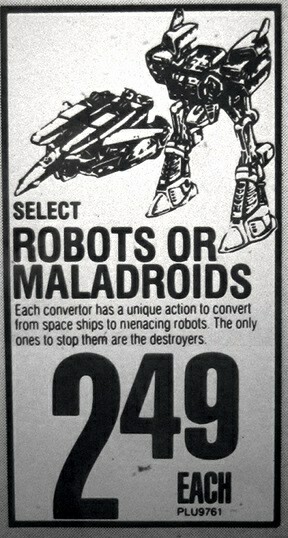 It's significant as the only ad I've found from 1984 using any sort of graphic of Jetfire. It's also available on Google's newspaper archive in the 09 December 1984 issue of the Pittsburgh Press (use the menu buttons to skip to page 107). The other is a nice Circus World ad from late November '85 that uses the figure's standard line art. 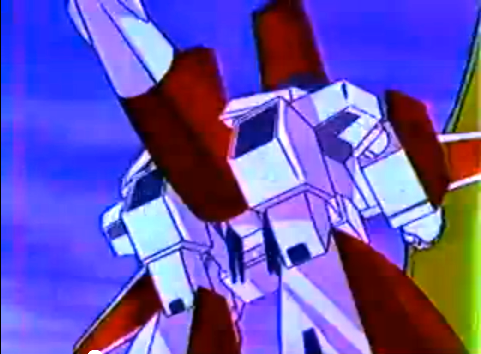 Although the line art doesn't show the white nosed prototype, it clearly depicts the missile firing rifle with a projectile sticking out of it, a feature production Jetifres didn't include. Why didn't Matsushiro license the patent out to Harmony Gold? Could the Bandai 1/55 Valkyrie have saved Robotech? Was Action Master Skyfall actually Action Master Jetfire?